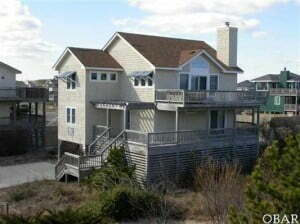 Location, location, location for this Ocean Sands Beach Home! Straight shot down to the beach! Location, location, location! Enjoy a straight shot down to the beach from this fantastic Ocean Sands beach home. With 5 bedrooms, 3 full baths, ample decking, large living area, screened porch, awesome ocean views, and excellent condition this home is a real gem. Guests love this place as evidenced by many returning year after year.